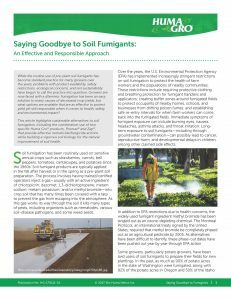 While the routine use of pre-plant soil fumigants has become standard practice for many growers over the years, problems with product availability, safety restrictions, ecological concerns, and soil sustainability have begun to call the practice into question. Growers are now faced with a dilemma: Fumigation has been an easy solution to many causes of decreased crop yields, but what options are available that are as effective to protect yield yet still responsible when it comes to health, safety, and environmental impact? This article highlights sustainable alternatives to soil fumigation, including the combination use of two specific Huma Gro® products, Promax® and Zap®, that provide effective nematicide/fungicide actions while building a vigorous soil biology for the natural improvement of soil health and fertility.